Switching Actuator N532D51 8 x AC 230 V 10AX (16A AC1) DALI switch/dimming module, 8x DALI channels (broadcast only) 6-Button Switch Titanium White without LED's Delta Miro style frame, UK style mounting frame compatible. Blind control module. 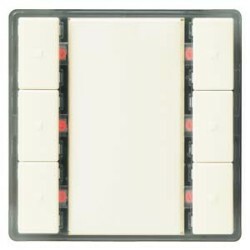 2x 230Vac blind motors (requires 5WG11184AB01) Semi flush mounted room controller and display Switching Actuator N532D31 4 x AC 230 V 10AX (16A AC1) Base module plain. UK style mounting plate.